Alabama Crown Distributing is delivering our 2019 Guild Collaboration around the state. Here is where you can find it! This post will be updated as we receive updates. 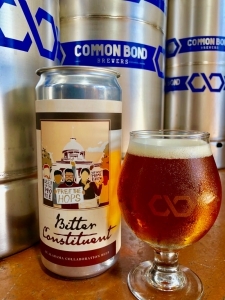 Bitter Constituent is also available on draft and in special crowlers at the host brewery, Common Bond Brewers in Montgomery. Dan Roberts is the executive director of the Alabama Brewers Guild. The Alabama Brewers Guild (ABG) is a 501(c)(6) nonprofit trade association representing the craft brewing industry in Alabama. The ABG’s mission is to promote a favorable legal and market environment for the craft brewing industry in Alabama.